Being a fanatic who spends almost every hour of the day checking out and toying with the ideas and possibilities about creating the perfect freshwater aquarium, sometimes you will always be left wondering, which of the design concept is the best for your tank. Always, this is one of the most challenging parts of fish keeping because after all, that is the whole purpose of having an aquarium in the first place. In fact it is the dream of every single hobbyist out there to set up the best fish tank and I’m not talking about getting the most modern equipment like a filter, lighting or having the largest aquarium size but what is more important, is creating the stunning looking view that would be the envy all your friends. Usually after having gone to the pet shops, you start to develop interests and the ideas will come along but before we go about putting things together, let us consider some of the options that we have and how do we want to go about achieving this? Most people get disappointed on not seeing the results that they desire but basically, all these happen because they fail to understand the requirements and also due to lack of ideas to visualize their perfect type of aquariums that they want. The articles here is meant to give a general guideline so that you can picture what you want in your mind and the rest is to leave it to your imagination and creativity to come up with your perfect theme design. Which type of aquarium themes that suit you? Some people do not realize that there are actually different kinds of setup which you can adopt as Design Concept for decorating your fish tank. Whether it is a small, medium sized or large enclosure for your pets, basically you can create all types of environment to resemble the natural look in the wild and it’s amazing what you can do when you can turn a barren tank to become a masterpiece work of art to grace your home. If you look around carefully and checking out public aquariums, there are various themes constructed to resemble different biotopes (plant and fish originating from the same geographical locations) such as the Asian tropical region, the colorful and heavily planted Amazonian style aquariums or you could even try to go for the Rocky African setup with caves coupled with strong backdrop. Being presented with so many choices, basically which type of these options should be best for you? The answer to this lies not only on what you like or want but it all depends on the type of freshwater fish that you want to keep. 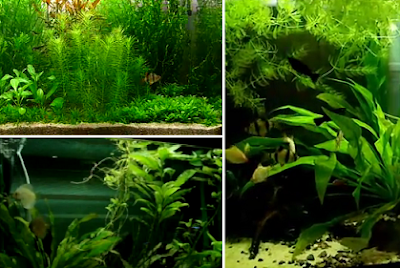 The Amazonian theme for example, comprises fish that share the same requirements like the discus, angelfish, all interacting harmoniously with one another or you can combine neon tetras and hatchet fish in another smaller biotope. There are exceptions however, as there are certain people who have specific preferences regarding their choice of fish (not from the same biotope) and in this case, the only option is to go for community aquarium which can be made up of different species of fish originating from different locality. But before you go about mixing different types of fish together, first check out the compatibility aspect whether all the selection that you intend to add to the tank, can they live and co-exist with one another and whether they all share similar living conditions like hardness level, pH and temperature? For instance, if you want to keep African cichlids mixed with Discus, I can tell you that this combination will never work out because discus requires fairly soft water while the African fish needs the opposite meaning that the water must be rich in mineral content to bring up the hardness level. On the other hand, there are some exceptions if let’s say you want to raise discus fish, you can actually have them together with catfishes. There are other factors as well because some freshwater aquarium species in generally can be very easy to take care but there are some which are extremely fussy, so all these have to be taken into considerations. There are other setups like for example the Dutch Aquariums which are quite rare these days and you can hardly find people showing interest in it except those in the Europe region. In this type of design, more importance is placed towards the natural beauty of the aquatic plants particularly on how they are arranged and displayed. Most of these tanks avoid putting any colorful fish and although this seems to project the kind of boring and dull impression, but however, the idea is that people will put more focus on the plants itself as the center of attention rather than the fish swimming in the tank. Some people add other aquatic living creatures like shrimps but mostly you will find colorless tetras especially those which belong to the tiny freshwater species gracing the Dutch aquariums. There are other professionally-created design concepts as well to admire and described as the perfect living underwater world. One particular example is the Japanese aquascaping developed by Takashi Amano who introduces the idea of modern aquatic garden.